What is the ANS Reward Points program? The ANS Reward Points program is designed with you in mind. We want our loyal customers to earn rewards for every purchase made at buynailsdirect.com. While you shop at buynailsdirect.com, you will earn and accrue reward points which are then redeemable toward your future purchases on our website. ANS Reward Points are an added bonus to your shopping experience on our site and just one of the ways we thank you for being a loyal customer. How does the ANS Reward Points program work? Every time you make a purchase you earn points based on the price of products or items purchased, shipping fees and taxes are excluded. These points are added and accumulated to your ANS rewards Points balance. You can redeem your reward points at checkout. If you have accumulated enough points to redeem then you will have the option of using points as one of the payment methods. Redeemable reward points can be used in conjunction with other payment methods such as PayPal, credit cards, and more. Your ANS Reward Points will be applied as a percentage discount on each item in your transaction, but will appear as a dollar amount applied. Please note that reward points will be deducted from your reward points if any product has been returned. Any products that are purchased through the reward points from a returned product purchase, your credit for the returned product will be less the reward points value used. For example, if you purchased a Beyond Master of Acrylic Brush, and then redeemed those reward points for Botanical Escapes Herbal Spa Pedicure Essential Oil, and then returned the Beyond Master of Acrylic Brush, your final credit will be less value of the Botanical Escapes Herbal Spa Pedicure Essential Oil. Or your credit for the returned product will be the same amount as we charged that products after applied redeemed points and your points will be credited into your account. Currently, for every $1 you send at buynailsdirect.com, you will earn 1 (one) point. Each point is worth $0.03 off a future purchase. During the checkout process, on the same page that you select a payment method, there will be a box to enter the amount of points you wish to redeem. Enter the amount of points you would like to spend or click the box to use all available points. Please not that you will still have to select another payment method if there is not enough in your ANS Reward Points account to cover the cost of your purchase. Continue the checkout procedure and at the confirmation page you'll notice that the value of the points redeemed will have been credited towards your order. Once you confirm your order, your ANS Reward Points account will be updated and the points used deducted from your balance. Currently, no minimum in total (per purchase) for US customers is required before any Points Redemptions can take place. • Limited Redeemable Points allowed per order based on how much of the shopping cart of next orders. • Will I earn points for shipping fees? When calculating the amount of points earned, shipping fees are excluded. • Will I earn points for tax fees? When calculating the amount of points earned, taxes are excluded. • Will I earn points for discounted products? Yes. When calculating the amount of points earned. All items which their price have been discounted are included. • Will I earn points when purchases paid with points? Yes. Please note that any purchase made by redeeming points will only be rewarded with additional points for the amount spent other points. • Do my points expire? No, points are not expired. 1. ANS Reward Points are only available to registered buynailsdirect.com members. 2. ANS Reward Points can only be collected and used with online purchases and are only validated at buynailsdirect.com. 3. Points are non-refundable and can't be transferred between members. 4. ANS Reward Points are non-transferable or exchangeable for cash under any circumstances. 6. 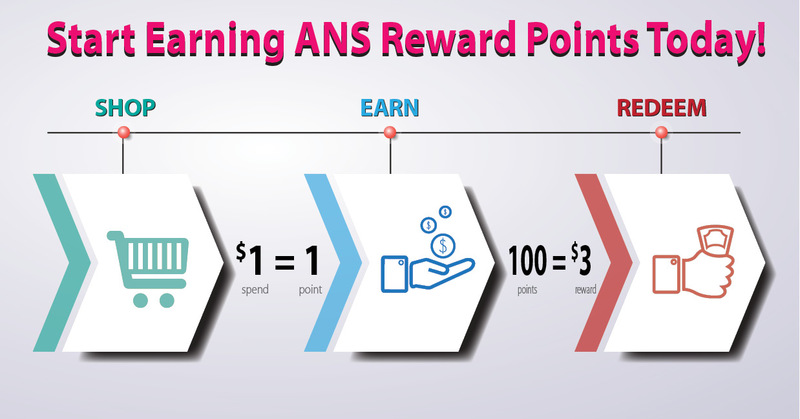 When buying with ANS Reward Points, you will still have to select another payment method if there is not enough in your Cash Reward account to cover the cost of your purchase. 7. When calculating the amount of points earned, shipping fees and taxes are excluded. Please note that we reserve the right to alter or make changes to this policy at any time without prior notice or liability. If you have further question, please contact us at any time. Customer Service Associate will be happy to help you.